Definition at line 23 of file SparcMCExpr.h. Definition at line 25 of file SparcMCExpr.h. Definition at line 100 of file SparcMCExpr.h. Definition at line 104 of file SparcMCExpr.h. References getFixupKind(), name, parseVariantKind(), and printVariantKind(). Definition at line 26 of file SparcMCExpr.cpp. Referenced by createSparcMCOperand(), llvm::SparcELFMCAsmInfo::getExprForFDESymbol(), llvm::SparcELFMCAsmInfo::getExprForPersonalitySymbol(), llvm::SparcELFTargetObjectFile::getTTypeGlobalReference(), hasGOTReference(), and LowerSymbolOperand(). Definition at line 162 of file SparcMCExpr.cpp. Definition at line 94 of file SparcMCExpr.h. References llvm::HexStyle::Asm, llvm::MCExpr::findAssociatedFragment(), fixELFSymbolsInTLSFixups(), and getSubExpr(). Definition at line 197 of file SparcMCExpr.cpp. References fixELFSymbolsInTLSFixupsImpl(), llvm::MCAssembler::getContext(), getKind(), llvm::MCContext::getOrCreateSymbol(), getSubExpr(), LLVM_FALLTHROUGH, llvm::MCAssembler::registerSymbol(), llvm::ELF::STB_GLOBAL, llvm::ARMBuildAttrs::Symbol, VK_Sparc_TLS_GD_ADD, VK_Sparc_TLS_GD_CALL, VK_Sparc_TLS_GD_HI22, VK_Sparc_TLS_GD_LO10, VK_Sparc_TLS_IE_ADD, VK_Sparc_TLS_IE_HI22, VK_Sparc_TLS_IE_LD, VK_Sparc_TLS_IE_LDX, VK_Sparc_TLS_IE_LO10, VK_Sparc_TLS_LDM_ADD, VK_Sparc_TLS_LDM_CALL, VK_Sparc_TLS_LDM_HI22, VK_Sparc_TLS_LDM_LO10, VK_Sparc_TLS_LDO_ADD, VK_Sparc_TLS_LDO_HIX22, VK_Sparc_TLS_LDO_LOX10, VK_Sparc_TLS_LE_HIX22, and VK_Sparc_TLS_LE_LOX10. getFixupKind - Get the fixup kind of this expression. Definition at line 86 of file SparcMCExpr.h. References evaluateAsRelocatableImpl(), Fixup, getFixupKind(), printImpl(), and visitUsedExpr(). Referenced by classof(), and getFixupKind(). Definition at line 123 of file SparcMCExpr.cpp. 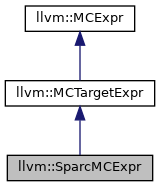 References llvm::Sparc::fixup_sparc_13, llvm::Sparc::fixup_sparc_got10, llvm::Sparc::fixup_sparc_got13, llvm::Sparc::fixup_sparc_got22, llvm::Sparc::fixup_sparc_h44, llvm::Sparc::fixup_sparc_hh, llvm::Sparc::fixup_sparc_hi22, llvm::Sparc::fixup_sparc_hm, llvm::Sparc::fixup_sparc_l44, llvm::Sparc::fixup_sparc_lo10, llvm::Sparc::fixup_sparc_m44, llvm::Sparc::fixup_sparc_pc10, llvm::Sparc::fixup_sparc_pc22, llvm::Sparc::fixup_sparc_tls_gd_add, llvm::Sparc::fixup_sparc_tls_gd_call, llvm::Sparc::fixup_sparc_tls_gd_hi22, llvm::Sparc::fixup_sparc_tls_gd_lo10, llvm::Sparc::fixup_sparc_tls_ie_add, llvm::Sparc::fixup_sparc_tls_ie_hi22, llvm::Sparc::fixup_sparc_tls_ie_ld, llvm::Sparc::fixup_sparc_tls_ie_ldx, llvm::Sparc::fixup_sparc_tls_ie_lo10, llvm::Sparc::fixup_sparc_tls_ldm_add, llvm::Sparc::fixup_sparc_tls_ldm_call, llvm::Sparc::fixup_sparc_tls_ldm_hi22, llvm::Sparc::fixup_sparc_tls_ldm_lo10, llvm::Sparc::fixup_sparc_tls_ldo_add, llvm::Sparc::fixup_sparc_tls_ldo_hix22, llvm::Sparc::fixup_sparc_tls_ldo_lox10, llvm::Sparc::fixup_sparc_tls_le_hix22, llvm::Sparc::fixup_sparc_tls_le_lox10, llvm::Sparc::fixup_sparc_wplt30, llvm_unreachable, VK_Sparc_13, VK_Sparc_GOT10, VK_Sparc_GOT13, VK_Sparc_GOT22, VK_Sparc_H44, VK_Sparc_HH, VK_Sparc_HI, VK_Sparc_HM, VK_Sparc_L44, VK_Sparc_LO, VK_Sparc_M44, VK_Sparc_PC10, VK_Sparc_PC22, VK_Sparc_TLS_GD_ADD, VK_Sparc_TLS_GD_CALL, VK_Sparc_TLS_GD_HI22, VK_Sparc_TLS_GD_LO10, VK_Sparc_TLS_IE_ADD, VK_Sparc_TLS_IE_HI22, VK_Sparc_TLS_IE_LD, VK_Sparc_TLS_IE_LDX, VK_Sparc_TLS_IE_LO10, VK_Sparc_TLS_LDM_ADD, VK_Sparc_TLS_LDM_CALL, VK_Sparc_TLS_LDM_HI22, VK_Sparc_TLS_LDM_LO10, VK_Sparc_TLS_LDO_ADD, VK_Sparc_TLS_LDO_HIX22, VK_Sparc_TLS_LDO_LOX10, VK_Sparc_TLS_LE_HIX22, VK_Sparc_TLS_LE_LOX10, and VK_Sparc_WPLT30. getOpcode - Get the kind of this expression. Definition at line 80 of file SparcMCExpr.h. Definition at line 83 of file SparcMCExpr.h. Referenced by evaluateAsRelocatableImpl(), findAssociatedFragment(), fixELFSymbolsInTLSFixups(), fixELFSymbolsInTLSFixupsImpl(), printImpl(), and visitUsedExpr(). Definition at line 86 of file SparcMCExpr.cpp. References llvm::StringSwitch< T, R >::Case(), llvm::StringSwitch< T, R >::Default(), name, VK_Sparc_GOT10, VK_Sparc_GOT13, VK_Sparc_GOT22, VK_Sparc_H44, VK_Sparc_HH, VK_Sparc_HI, VK_Sparc_HM, VK_Sparc_L44, VK_Sparc_LO, VK_Sparc_M44, VK_Sparc_None, VK_Sparc_PC10, VK_Sparc_PC22, VK_Sparc_R_DISP32, VK_Sparc_TLS_GD_ADD, VK_Sparc_TLS_GD_CALL, VK_Sparc_TLS_GD_HI22, VK_Sparc_TLS_GD_LO10, VK_Sparc_TLS_IE_ADD, VK_Sparc_TLS_IE_HI22, VK_Sparc_TLS_IE_LD, VK_Sparc_TLS_IE_LDX, VK_Sparc_TLS_IE_LO10, VK_Sparc_TLS_LDM_ADD, VK_Sparc_TLS_LDM_CALL, VK_Sparc_TLS_LDM_HI22, VK_Sparc_TLS_LDM_LO10, VK_Sparc_TLS_LDO_ADD, VK_Sparc_TLS_LDO_HIX22, VK_Sparc_TLS_LDO_LOX10, VK_Sparc_TLS_LE_HIX22, and VK_Sparc_TLS_LE_LOX10. Referenced by classof(), and hasGOTReference(). Definition at line 31 of file SparcMCExpr.cpp. References getSubExpr(), llvm::MCExpr::print(), and printVariantKind(). Definition at line 42 of file SparcMCExpr.cpp. References VK_Sparc_13, VK_Sparc_GOT10, VK_Sparc_GOT13, VK_Sparc_GOT22, VK_Sparc_H44, VK_Sparc_HH, VK_Sparc_HI, VK_Sparc_HM, VK_Sparc_L44, VK_Sparc_LO, VK_Sparc_M44, VK_Sparc_None, VK_Sparc_PC10, VK_Sparc_PC22, VK_Sparc_R_DISP32, VK_Sparc_TLS_GD_ADD, VK_Sparc_TLS_GD_CALL, VK_Sparc_TLS_GD_HI22, VK_Sparc_TLS_GD_LO10, VK_Sparc_TLS_IE_ADD, VK_Sparc_TLS_IE_HI22, VK_Sparc_TLS_IE_LD, VK_Sparc_TLS_IE_LDX, VK_Sparc_TLS_IE_LO10, VK_Sparc_TLS_LDM_ADD, VK_Sparc_TLS_LDM_CALL, VK_Sparc_TLS_LDM_HI22, VK_Sparc_TLS_LDM_LO10, VK_Sparc_TLS_LDO_ADD, VK_Sparc_TLS_LDO_HIX22, VK_Sparc_TLS_LDO_LOX10, VK_Sparc_TLS_LE_HIX22, VK_Sparc_TLS_LE_LOX10, and VK_Sparc_WPLT30. Referenced by classof(), EmitHiLo(), and printImpl(). Definition at line 234 of file SparcMCExpr.cpp.